As most people have figured out by now, nail art today is much more modern than the gaudy fake talons of the past. Recently, the trend has been towards crazy colors, bold patterns and innovative designs. And although it's tempting to try out the craziest designs first, it's best to start out with something simple. Luckily there are several nail art trends that are easy for beginners. Glitter gradient is one of the coolest new trends in nail art. It's simple, sparkly and interesting and will definitely get people to notice your nails. You can do the glitter gradient with a bare nail underneath or with a colored base coat-- either way it makes an impact. A bonus to the glitter gradient is that since there are several coats of polish on the tips of your nails, they're less likely to chip! 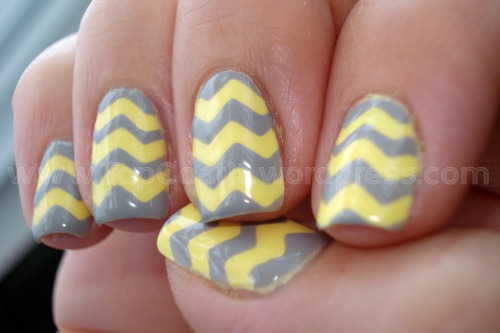 Chevron stripes are everywhere and with a little tape and a couple colors, you can have the same look on your nails. I've yet to try this myself, but it's definitely on my list of trends I want to try. Tip: Whenever doing designs involving tape, make sure the base color has completely dried before you put the tape on. If you don't wait long enough, the tape will pull the color up with it and leave residue when you remove it. 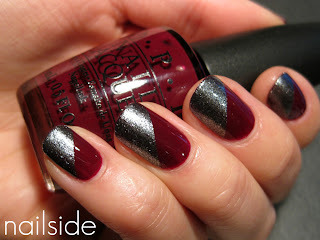 The diagonal stripe may be easiest of the three, since it only involves two colors and not much taping. It can also be the boldest, depending on the color combination you choose. I personally like this design the best because there are so many possibilities. One of my favorites (that of course I never took a picture of) was fuchsia and coral, which appears color-blocked. Of course if you're not feeling daring, you can always use colors that are close to each other for trendy yet conservative look. Cristin is the editor of Sociosonic. She has a bachelor's degree in sociology and works in healthcare administration.